His enthusiasm for karting, an expensive hobby, presented the Räikkönen family with a tough choice: home improvements and an inside toilet or another season on the track and in the outside loo? The decisive family meeting was held in a familiar location - around the kitchen table. The decision came down: postpone the improvements, continue with the outside loo and see how far Kimi could go in the summer season. When the younger brother at last began to earn significant amounts of money from his driving, the improvements finally got under way - not only in the loo, but in many other places as well. 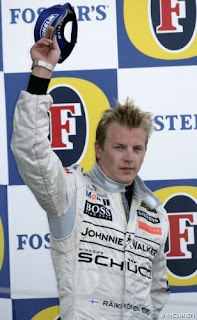 In March 2008, Räikkönen confirmed to a Guardian reporter that the outside toilet was still in use when he signed his first Formula One contract with the Sauber team in the year 2000. To urban Brits, an outside loo was something exotic and amazing. 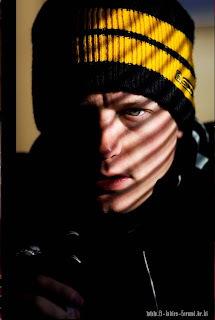 When the reporter asked him how on earth it was possible to use an outside toilet in sub-zero winter temperatures, Räikkönen had his answer ready. “It’s easy, just be quick,” he said. Jerez de la Frontera, 10th December - A sunny second day of testing for Kimi Raikkonen. But the Finnish driver had to wait for half of the morning, so he could run on slicks, as the track remained wet for a long time in the morning. Furthermore the session had to be interrupted, because Alonso's Renault spun off the track. "We haven't done many kilometres over these two days, because the conditions weren't really good," Kimi said when he met the press during the lunch break. "We're mainly trying to understand how the slicks work and we're testing some solutions the car will use in the upcoming season. It's useless to speculate about what will be in the future. Too many things are different on the cars on the track. To get a precise idea we have to wait until we all have the new cars." "Obviously I was really surprised by Honda's decision last week, but I don't want to comment what's happening at the moment." Kimi Räikkösen uusin lelu on luksusmaasturi, jonka tarpeellisuutta epäilevät jopa autoharrastajat. 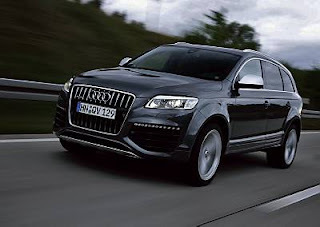 Räikkösen vastikään ostama Audi Q7 V12 TDI on varsinainen voimanpesä. Siinä on 12-sylinterinen v-moottori, joka on maailman tehokkain dieselmoottori. Superkatumaasturia kokeilleiden mukaan moottorin tehon huomaa varsin hyvin kiihdyttäessä. Auto kiihtyy nollasta sataseen reilussa viidessä sekunnissa, vaikka se painaa peräti 2,6 tonnia. - È amico di qualche pilota in particolare? "C'è feeling con Kimi (Raikkonen; n.d.r. ), alle volte ci vediamo e passiamo del tempo insieme visto che abitiamo entrambi in Svizzera". Quali sono i suoi hobbies? "Mi piacciono un po' tutti e il mio allenamento in particolare. Ho particolarmente apprezzato la scalata del monte Fuji in Giappone dopo il GP di quest'anno". Kimi attended the telethon organized in Italy. The sweet thing is around 2:20 you can see him and Massa play with a little baby (they were actually at the Ferrari Christmas Party). Kimi eventually takes the baby in his arms and carries him away. Finland's latest motor racing hope Kimi Räikkönen is in a strange situation. He has a long-term contract in his pocket to become a team driver for the Formula One Sauber stable, he is even able to talk to the press about it, but he will have to wait at least a month to learn when he is to be allowed to drive in F1 racing. Only in December will the sport's official body the FIA rule on whether the 21-year-old Räikkönen can get the required superlicence to drive next season. Whatever happens, Räikkönen's liaison with the Swiss racing team will begin officially from the beginning of next month with tests in Jerez, and will continue for several years. Räikkönen's manager Steve Robertson expressed his enthusiasm at the deal, and said that now everyone was crossing their fingers for a positive decision from the FIA. The contract, believed to be for five years, does not stand or fall on whether Räikkönen gets a superlicence. If the FIA give the thumbs-down, then Räikkönen will be a test driver for Sauber next year and will try again for Formula One qualifications for the 2002 season. This would probably also involve Räikkönen keeping his hand in driving in lower echelons of motor racing. At present opinions are divided on how likely the granting of a superlicence is, but the early December tests will be important to convince the FIA of Räikkönen's ability to drive at least 300 kilometres at high speeds, and to overcome the rather obvious lack of experience on his scoresheet so far. The former Formula One World Champion Keke Rosberg, who is these days heavily involved in managing other drivers, has commented that the Räikkönen deal could revolutionise the world of F1 racing. Speaking to Autosport, Rosberg said that things will change radically if the youngster gets a superlicence, and the drivers' market would be turned on its end. He argued that this sort of thing would not have happened in his driving days (Rosberg was World Champion in 1982), since the cars were so powerful and so much harder to keep on the track. Rosberg believes that racing teams would now have an incentive to hire younger and younger drivers. This would reduce their payroll costs appreciably, since the young and up-and-coming drivers would come a great deal less expensively than established stars such as Mika Häkkinen or Michael Schumacher. In the case of Räikkönen, he would be making a giant leap from the modest surroundings of Formula Renault racing straight to the big time, without passing through the usual "holding zone" of Formula 3 and Formula 3000. These categories would in turn tend to lose their significance if other drivers were to follow Räikkönen's path. 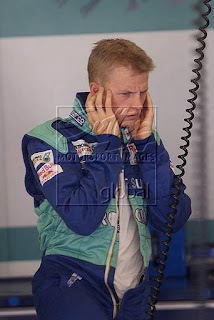 Kimi Räikkönen's earlier stint testing for Sauber was reported in our weekly section some time back. The article gives some details of a driver whom sports fans may be reading about in the years ahead. Kimi Räikkönen ja Felipe Massa olivat mukana, kun Ferrari-perhe kokoontui viikonloppuna autoyhtiön joulujuhliin Italiaan. Paikalle oli kutsuttu suuri joukko autoyhtiön työntekijöiden lapsia, joiden kanssa Räikkönen ja Massa poseerasivat kuvissa ja jakoivat nimikirjoituksia. Juhlahumun keskellä he esiintyivät suorassa lähetyksessä Italian RAI-televisokanavan hyväntekeväisyystempauksessa. Lisäksi kuljettajakaksikko osallistui "Voiton konsertti"-nimiseen iltaohjelmaan, jossa esiintyi mm. rocklaulajatar Gianna Nannini. Kimi Raikkonen has told Ferrari that he is 'determined' to make amends for his disappointing 2008 campaign as he eyes a second world title next year. 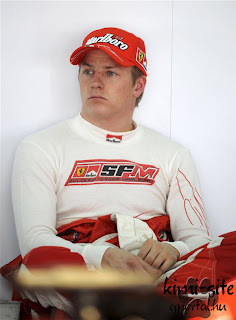 The Finn endured a difficult season - primarily frustrated by his inability to get the best out of the F2008 in qualifying – and was forced to play a supporting role to teammate Felipe Massa in the closing stages of the year. But despite the troubles, Ferrari kept their faith in Raikkonen and team president Luca di Montezemolo has no doubt that the 2007 world champion will be on top form again. 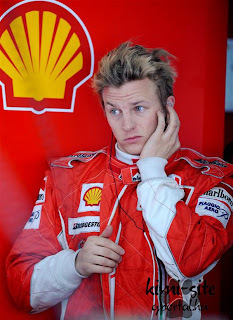 "I joke that we had Kimi until Magny Cours, then he was busy and he asked a friend of his to drive," di Montezemolo told selected media including autosport.com at Maranello.This friend was a very good driver. 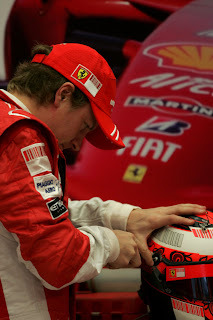 He put on Kimi's helmet, but now we finally have the proper Kimi back again." Formula One drivers will be the next to suffer the consequences of the worldwide economic downturn by being forced to accept reduced wages, claims Ferrari's team boss. With the FIA and the teams having worked hard in recent weeks to thrash out a major overhaul of the technical rules to help reduce budgets, there are widespread hopes that the sport can see itself through the difficult financial times. But Ferrari team principal Stefano Domenicali thinks such cost savings are only the start of a spending clampdown that teams are going to have to go through - and he believes drivers will be the next target. "I think that in the following months there will be a major revolution, also with the drivers, as far as retainers are concerned," Domenicali said in an interview with Italian magazine Autosprint. Domenicali believes that the momentum for such a drastic course of action - which could go as far as current terms having to be renegotiated - will come from the bigger teams. "Let's be clear: at a moment when the teams, whether big or small, must reduce costs in a significant way, one could feel like saying you need an ace to make the difference," he explained. "However, I feel that in the current climate the big teams - the small ones can't do that now - won't have the ability anymore to think of offering certain amounts of money that some drivers get. So discussions can be held on this issue." When asked whether terms of contracts that were recently signed, such as Kimi Raikkonen's fresh deal announced in Monza, could be changed, Domenicali said: "Anything can be modified in life. "The important thing is wanting to do it. We know the terms of the contract. However, I'm convinced that this issue will soon be discussed among all the teams and with every driver." Another nightmare for the motor racing commentators? "Hmmm... So why is it, then?" 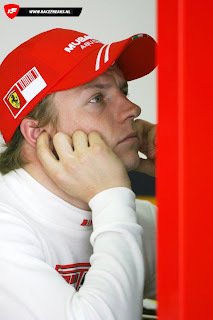 Kimi Räikkönen (it's pronounced something like Ryke-Kon-en, by the way) stares at the read-out on the display unit in the pits at the Autodromo Internazionale del Mugello racetrack between Bologna and Florence, and he wonders aloud why his best lap-time - 1.26.418 - is more than a second slower than the fastest recorded today. The timekeeper starts to explain the effects of different fuel quantities on the speed of an F1 car, the balance the Red Bull Sauber Petronas team have set up for the day, and the differing test purposes. But perhaps it also has something to do with the fact that that faster time was set by two-time World Drivers' Champion Michael Schumacher in his Ferrari and the slower one by a 20-year-old Finnish youth who has barely 100 laps in a Formula One car under his belt. Räikkönen himself seems quite unmoved, even if the point of comparison is one of the undisputed giants of motor racing. His goals are right up there where the air is thin. And the door to Grand Prix racing is already ajar. At the beginning of September, Räikkönen was offered a chance to test a Sauber F1 car. His lap-times so impressed the Swiss team that last week he was back again behind the wheel of a Sauber for three days. Räikkönen thanked them for the opportunity and went out and clocked the fastest time by a Sauber on the Mugello circuit this season. I find myself asking how the devil this is possible. 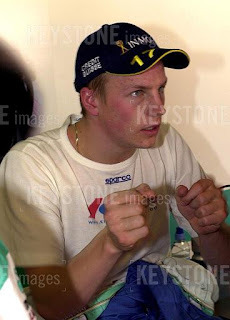 Kimi is a rather diminutive young man, and in his baseball cap and T-shirt he looks no different from any other 20-year-old. Just two years ago he was driving go-karts. 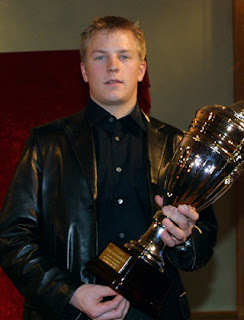 Kimi Räikkönen's first team was one formed with his brother. 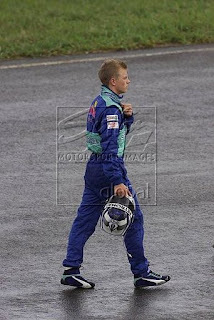 The two boys started in motocross, but then Kimi's father took them to watch a karting meet. "The next time we went back there with my own go-kart", says Räikkönen. He was then eight years old. "I did motocross as a little kid, so it was through that that these other beasts started to look interesting. I had no driver idols or models to lean on - I was just driving for the fun of it. I guess it was simply the speed that fired me up." 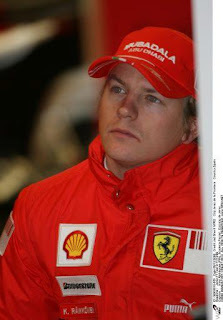 Kimi began to gain some success here at home, and before very long he was also winning races abroad. In 1998 the time came to move to Holland, and last year he settled in Britain, after a test drive in a Formula Ford convinced onlookers he was a force to be reckoned with. He promptly moved up a stage to take part in the 1999 Formula Renault Sport Championship. He finished third in his first outing, and won the winter season in a Manor Motorsport Renault with four wins from four races. This year he had the Formula Renault title wrapped up by the end of August, with two races still to be run. The rules of this very competitive class ensure that every driver has identical equipment - and talent and racing ability are the keys to success. Räikkönen would appear to have these in spades; he won seven starts during the season, and was on the podium in his three other appearances. People were already talking in hushed tones about the boy's dazzling potential in the dry and in the wet. Räikkönen himself was pleased at his success, but not over the moon: "It would just have been nice to win all of the races", he commented in his rather laconic but very telling fashion. Kimi Räikkönen's career has been given an extra push by the managerial duo of Dave and Steve Robertson, who picked him up some years ago from behind the wheel of a go-kart. The Robertsons negotiated a contract to drive in Formula One this season for another 20-year-old, Britain's Jenson Button (Williams), and now their attention is being concentrated on Räikkönen, even if his name will be a mouthful for all but Finnish commentators. The managers are unstinting in their praise for the youngster. The Robertsons have already named him as "a superstar of the future". Gerrit van Kowsen, who looked after Kimi during his stint at Mugello, is of the same opinion. "I've worked with the Robertsons since the 1980s, and I have never, not ever, seen a driver who adjusts so quickly to a new breed of car. Normally you can expect a driver to take several days to come to terms with the differences from one formula to another, but Kimi was out there driving competitive lap-times in an F1 car after only a couple of circuits of the track." 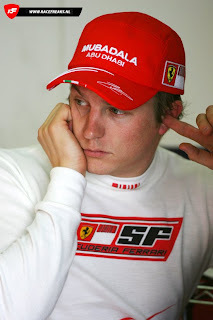 If van Kowsen has any reservations at all about Räikkönen, they do not focus on his ability to drive a car so much as on his rather retiring personality, which is said to be not unlike that of Mika Häkkinen. 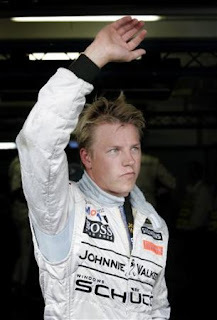 Häkkinen has been obliged to learn how to deal with the spotlight and the press, but the label of "Ice Man" has still stuck with him, in part after journalists found him somewhat difficult to interview. "Kimi's speed leaves nothing to be desired", assures Jacky Eeckerlaert, who ran the Sauber tests last week. "He's coming along very fast, but he's smart enough not to try to do it all at once. I like his calm approach. Of course he's short on experience, but I believe he has great potential." The Finnish Defence Forces make sure they get their penny's worth, and next week Räikkönen will be back in barracks and uniform serving out an additional two weeks of his national service prior to emerging into civilian life. In other respects his future is an open book, but with many possible engagements pencilled in the margins. The British Formula 3 stables are interested in acquiring the services of the promising young Finn, and talks have also been held with a couple of F1 teams. The idea that he might make the jump straight from Formula Renault to the big leagues is anything but likely, but he could find a place as a test-driver. "Sure, it would be way cool to do something in F1. I mean, I guess I would not be driving if I didn't have aims to get to the very top", says Räikkönen. "But if it doesn't happen for me this time around, then I'll drive in the F3 series in Britain." Räikkönen has also been given support by Mika Salo, who drives for Sauber until the end of this season, when he moves to the new Toyota F1 team. "I've seen Salo, and he has briefed me on the practical side of things, and given me some hints on what to do and what not to do", reports Räikkönen. "He says I can always call him up if I have something to ask." If Kimi Räikkönen's F1 dreams come true, it will mean a radical change in his life, and not just in the horse power and handling of the cars he drives. He's already had a foretaste of what might come: his mobile phone is hardly ever silent, and the Italian journalists who came to check out Schumacher's performance took a keen interest in the progress of the lad from Espoo. "I suppose I shall just have to get used to it. The phone tends to ring a bit much. But then again, I kind of hope this is only the beginning. It would be nice to be able to retire in ten years from now to spend my winnings", Räikkönen says with a definite tongue in cheek grin. "But really the driving is more important to me than the money. Money would be a nice bonus; it certainly makes life easier." 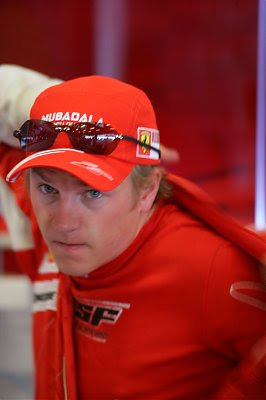 Kimi Raikkonen was unable to retain the title he won last year but vowed to return stronger next season. “I would have preferred to be here collecting the World Champion’s trophy for a second consecutive time, but this year, things did not go my way. The season got off to a good start, but then, for various reasons, the situation got complicated and by the time we were back on form, it was already too late. Massa and Raikkonen ensured that Ferrari took the Constructors’ Trophy for the second successive season and Stefano Domenicali was delighted to collect the prize in his first year as team director. Former world champion Kimi Raikkonen believes new regulation changes next year make it virtually impossible to make firm predictions about the form of any team in 2009. A major aerodynamic revamp, the return of slick tyres and the introduction of Kinetic Energy Recovery Systems (KERS) have provided a host of challenges to teams in preparing for the new season. 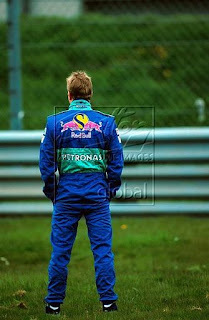 And that has left Raikkonen unsure of what impact it will have on each team, or even how much it will open up the field. "There are many more question marks compared to last year, everything is very different," he was quoted as saying by Gazzetta dello Sport. "If you do everything well you can have some advantages, while if you do things wrong it can cost you a lot. But this is no time for speculation." Raikkonen is also unsure yet of how big a challenge the new slick tyres will be - having tried them out extensively at Jerez on Wednesday. "I think in the end the tyres will work well, but it takes time to get used to them," he said. "In general I prefer slick tyres, but if I think back at the grooved tyres, thanks to the competition between Michelin and Bridgestone they became very good. "When we moved to a single supplier, the push from competition ended. So it's better to wait and see." Formulatähti Kimi Räikkönen aikoo viettää joulun Suomessa. Räikkösen asianhoitaja Riku Kuvaja ei vielä osannut sanoa, viettääkö Kimi jouluaaton omien vai Jenni-vaimonsa vanhempien luona. Tarkkoja suunnitelmia Kimi ei ollut vielä jouluaatoksi tehnyt, mutta varmaa on, että he viettävät Jennin kanssa joulun Suomessa. Räikkösen loma loppui äskettäin ja mies oli jo tiistai-aamuna testaamassa autoaan Espanjassa, Jerezin radalla. Kuvaja kertoi, että Räikkönen vietti kuukauden pituisen lomansa ottaen rennosti. Formula Star Kimi Räikkönen is planning to spend Christmas in Finland. Räikkönen personal assistant Riku Kuvaja not yet able to say, shall they spend Christmas with Kimi's or Jenni-wife's parents. Exact plans for Kimi had not yet made a Christmas Eve, but it is certain that they will spend the Christmas Jenni and Kimi together in Finland. 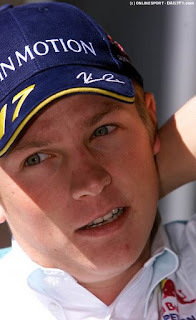 Räikkönens vacation ended recently and the man was already on Tuesday morning to test a car in Spain, JEREZ track. 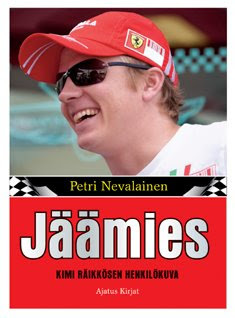 Kuvaja reported that Räikkönen spent the month-long vacation, taking it easy. Formula ykkösten MM-sarjassa kolmanneksi sijoittunut Kimi Räikkönen on valittu Vuoden autourheilijaksi Suomessa. Valinnan teki autourheilun kotimainen lajiliitto AKK-Motorsport ry. Viime vuonna maailmanmestaruutta juhlinut Ferrari-kuski voitti palkinnon toisen kerran perättäin. Rallicrossin kolminkertainen Euroopan mestari Jussi Pinomäki pokkasi vuoden autourheiluteosta myönnetyn Hans Laine -palkinnon. Nuoren mestarin kiertopalkinnon sai 19-vuotias Valtteri Bottas, joka voitti formula Renault 2.0 -luokassa Euroopan pääsarjat. AKK muisti tilaisuudessa myös 60 vuotta itsenäisyyspäivänä täyttävää Keijo Rosbergia, jolle myönnettiin liiton kultainen suurmerkki. 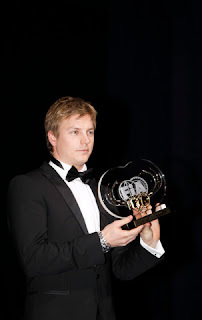 Kimi has been elected as the motor sport racer of the year in Finland. 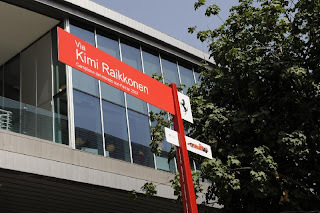 It seems Kimi has his own street :) . 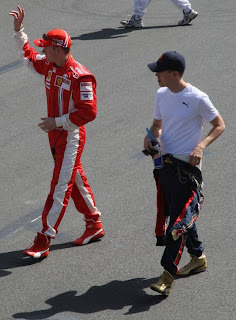 Via Kimi Raikkonen in Maranello. Oh my goodness. Was it really only three years ago that Kimi Räikkönen was preparing for the first Formula One Grand Prix of his career in Melbourne? At the time, Räikkönen was something of a Wunderkind, having leaped straight from the Formula 3000 series to the top echelon of motor racing. As Räikkönen's F1 debut with the Sauber team approached, the meanest competitors sanctimoniously claimed that the young man would be a security hazard. In Melbourne, he performed some tricks with a mountain bike and looked like he was better suited for a bicycle than the cockpit of a Formula One vehicle. Räikkönen gave the sceptics a taste of things to come at his very first Grand Prix: he brought his Sauber to the chequered flag in sixth place, scoring his first-ever world championship point. This weekend Räikkönen has much more pressure on his shoulders. Now a victory is what is expected of him - not just in Melbourne on Sunday, but also in the drivers' world championship race after the season's 18 Grands Prix. "Winning is my only goal. To win the world title and as many races as possible." Both Formula One baron Bernie Ecclestone and two-time world champion Mika Häkkinen are prepared to place bets in favour of Räikkönen this year. "We will see on Sunday. You are not able to say anything until the first race is over and you see how fast your car and the others' cars are. They cannot be compared except in a race." 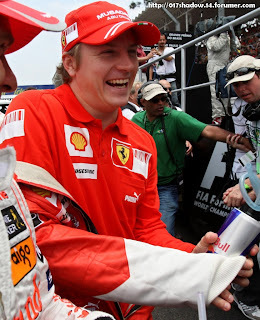 Last year, Räikkönen lost the drivers' world championship to Michael Schumacher by a mere two points. The German had to work hard to earn eighth position in the season finale with his Ferrari, thus securing one valuable point. 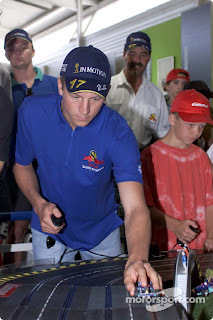 Schumacher won six races last year. The only victory of Räikkönen's season and career came in Malaysia, the season's second venue. Räikkönen was on the podium in second place in seven of last season's Grand Prix. Beating Schumacher alone may not even suffice this year. Räikkönen is the first challenger, but not the only one. McLaren team head Ron Dennis believes that the season will be very even between the top teams. "Ferrari, McLaren, Williams, and Renault are fighting hard, harder than for years. And you cannot forget surprises. BAR will surely be a bigger player than last season", Dennis said. Formula One chiefs are in the habit of touting how much they believe in the victory of their own drivers. Ron Dennis is not like this. "I am never sure about anything before the season's first race." On the track, Räikkönen drove like an experienced master already in his first season, but when in the public eye, he was still a boy, shy and quiet. "No", "Yeah", and "I don't know" were the most common answers. In three years, his comments have become more voluble and polite, but it is no use to expect any exuberance from Räikkönen anywhere else than behind the wheel. We will do everything we can so that this year the difference in world championship points would be to our advantage", Räikkönen chose his words on Thursday. He prefers to speak in plural terms, for the whole McLaren team. One time after the next, he patiently repeated to the reporters how he is confident in the new McLaren car, how it is too early to tell what the coming season will turn out to be like, and how tough the competition is between the top teams. At the beginning of the session, Räikkönen even managed a few smiles. In previous years in Melbourne, lady luck has definitely smiled upon Räikkönen. In his earlier outings at Albert Park, Räikkönen has once finished sixth, and twice third. 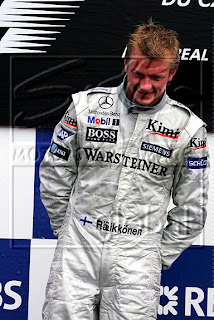 Last year, a sure-looking victory slipped to team-mate David Coulthard due to a speeding penalty. "It is great to start off the new season here again. Of course it would be perfect to start the season with a win, but the most important thing is to reach the finish line and score some points", Räikkönen stated on Thursday. A moment later, he said the same thing to a German television station. And then to another TV-station. The smile was gone, and Räikkönen's thoughts were obviously elsewhere, probably with Sunday's race. Maranello - The season is over and this is the verdict: Ferrari won again! The last race was a mirror for the Championship. We were really strong and we gained an excellent result, but not the perfect one. The most important thing is that the Team gained the Constructors' World Title; the most realistic goal we could reach in this last race. 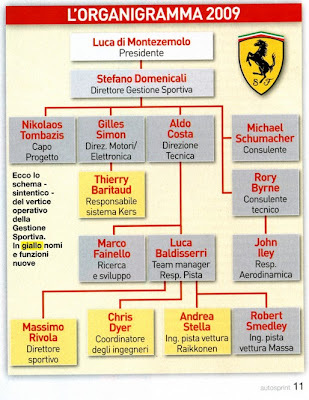 It's a very important result for all who work for or are part of the world of Ferrari: the people from the Scuderia, our partners, and more above all Stefano Domenicali, during his first year as Team Principal. It's also a little victory for me, at the end of a difficult and complicated season. It's good to win after such a year; it shows how united the Team has been and that we have fought right until the end. My hopes ended up in smoke at Spa and Monza. From then on I tried to gain as many points as possible for the Team and I tried to understand how to improve things for the next year. I want to congratulate Lewis Hamilton. He gained more points than any other driver and the one who's leading the standings earns the title. It doesn't make sense to think of the "ifs" and "buts"; that only makes you feel worse and it won't change anything anyway. I'm sorry for Felipe: the situation last year was very similar and things went our way; this year it went the other way. It was a season our fans will remember for a long time. Now it's time to relax and to celebrate together with our supporters at Mugello another win of the Constructors' Title. Then we'll think about our holidays, to charge the batteries for the 2009 season. The last season didn't go as I wanted. It started very well, but then there were too many negative moments. We made some mistakes, as did our competitors. But we paid a higher price for them, we couldn't make up and I was out of the title race too early. But this is already part of the past. Next year we'll be back to win again. There will be new rules and many things will change. So it's difficult to say how it will look like in 2009. But I think that we'll be competitive again. Whenever there were changes Ferrari usually managed to adapt to them faster as all the others. We have to wait and see what our capacities will be and we can reach in the next Championships.